As important as cementing and painting your plastic model with love and care is putting the decals on. They sort of give the model it's personality. But decals require their special handling as they're delicate and also you mostly only get one chance as there's only one set in the kit. Most importantly you'll need a tray of water. Preferably the water should be luke warm. But if it turns cold don't worry, it just takes a little longer for the decal to loosen from the decal sheet. 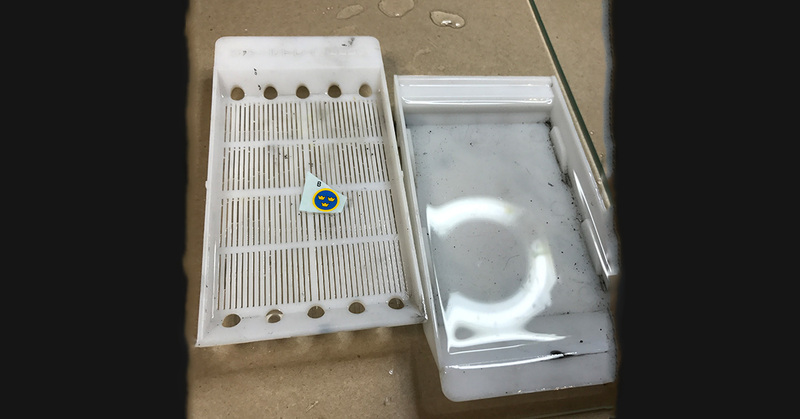 A good idea is to put a drop of dish soap in the water as this removes the surface tension and makes it easier to soak the decal sheet. There is a special decal tray from Trumpeter that makes some sense. But any tray will do. To handle the decals there's a few tools that is good to have handy. Scissors or a knife to cut out the decals you need from the sheet and and a stiffer brush to handle the decals on the model surface. Well, the obvious we've already mentioned, water. But there is two more that I'd say is quite important to succeed with you decals. 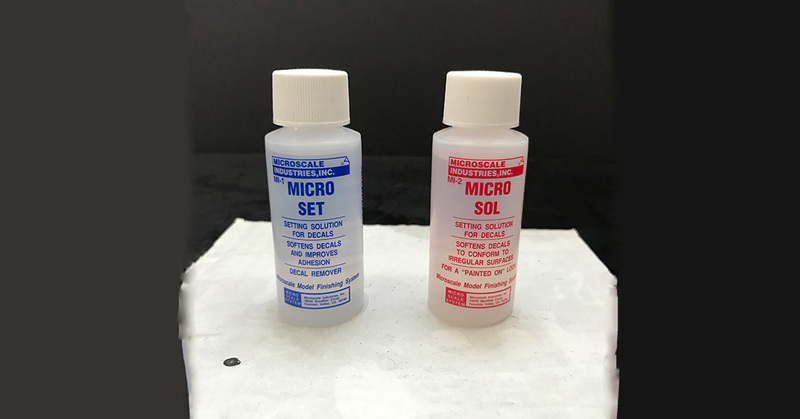 There's several types with different names but my favourite is from Microscale Industries Inc. and called Micro Set and Micro Sol. 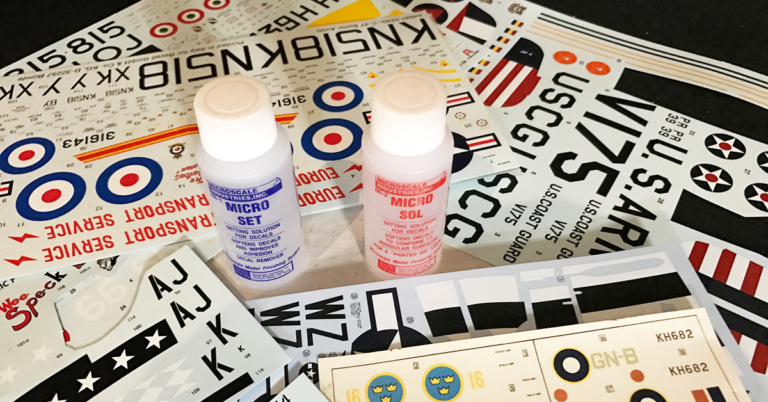 Micro Set improves the adhesion properties of the decal and Micro Sol softens the decal to conform better to the surface. More about them later. If you've read the "Paint me down"-section by now you know that decals adhere better to gloss surfaces. So a coat of gloss varnish on your model is a good prerequisite. If you want a matt or satin finish this will be fixed later (see below). In my early modelling years I used to soak the entire decal sheet at once. Don't. There's so many reasons why I won't bore you with them here. Cut out the decals from the sheet and handle the one by one. First place the decal in the water for a few seconds until the paper is soaked and then place it on a suitable surface until the decal loosens from the paper. If you want to use Micro Set this is the time when you apply this with a brush on the surface where the decal will go. But if you do be careful when placing the decal because it can be hard to adjust it with Micro Set underneath. Pick up the paper with the decal, with you fingers or if it's small better with tweezers. Holding the paper to the model carefully transfer the decal to the surface. Try to transfer it as close to it's final position as possible. Now adjust the decal to the exact position. You can do it with your fingers but keep in mind that if you're not careful the decal might end up on your finger rather than on the model. Some use cotton buds/topz to adjust them but I find that, at least for small decals, they have the same problem as your fingers. I carefully use a scalpel to do the final adjustments. If your decal gets stuck in the wrong place just add a few drops of water until it moves freely on the surface again. When the decal is in the right place carefully dab it with a stiff brush. Try not do drag it out of place but force all bubbles of air out from underneath the decal. 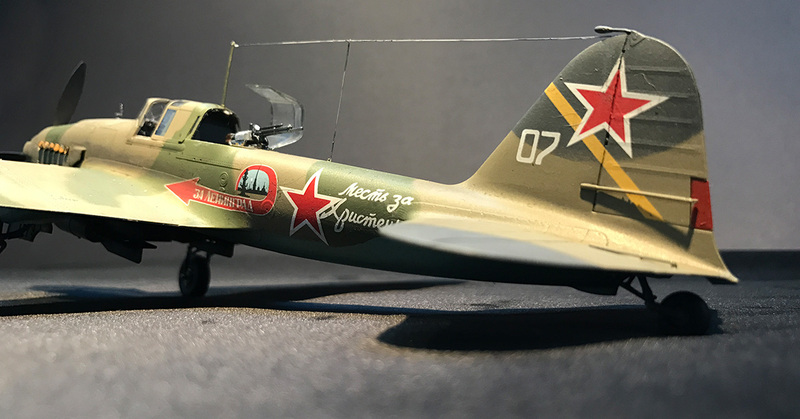 For the final result it's important to get rid of all the air bubbles, specially from underneath transparent parts of any decal. 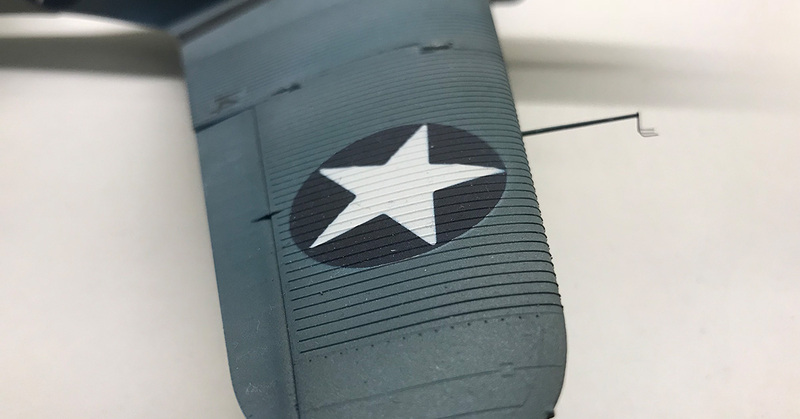 Now if the decal goes over an uneven part of the model, such as a panel line, then you want the decal do conform to this to get that painted on feeling. This is where the Micro Sol comes in. Micro Sol will partially dissolve your decal so make sure that it's in the exact place before you apply the solvent. Dip a brush in Micro Sol and carefully paint it on the decal and then leave it. The decal will dissolve and sink into any irregularities. If you're not happy with the first try the just repeat until you are. You can try to carefully press it down with the stiff brush. But do it one step at the time. The solving process is just that, if you over do it the decal will come apart. In real life the insignias and texts on a plane, vehicle or whatever is painted on. 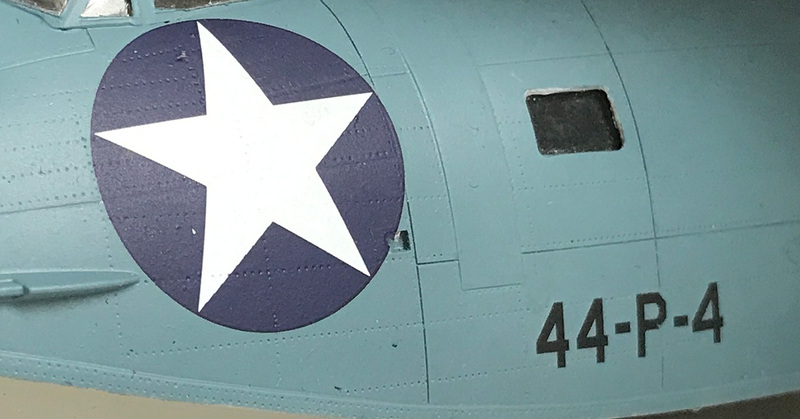 So you really want your decals to have the same finish as the rest of your model. 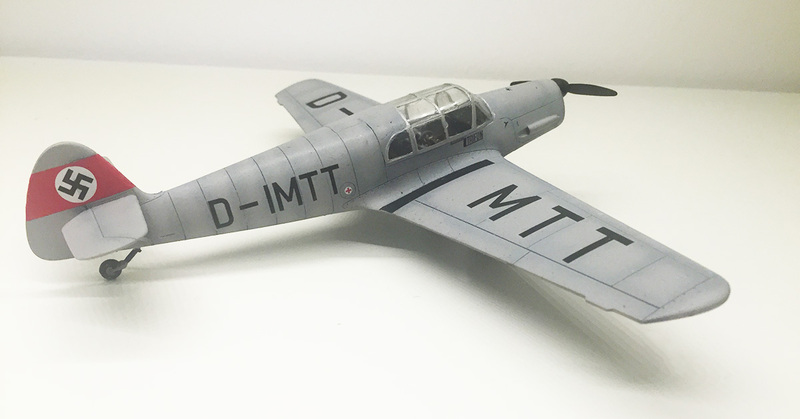 This is achieved by adding coats of varnish on after the decals are in place. This not only protects the decals as such but also gives that "painted on" look. Maybe a bit off topic here but lately I've started to try paint masks instead of decals. There are after market paint masks to be bought for some markings. This make sense specially if the surface is a challenge as it is on the Devastator and the Dauntless in the example pictures on the left. 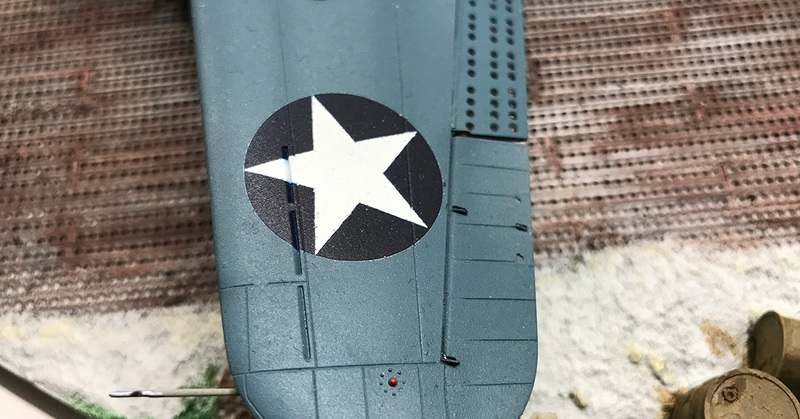 A paint mask is more of a challenge than decals as it requires patience to place right and you need to replace different parts when you do different colours. But the result is worth it. Next article: How's the weather?